May 17th, 2013 | Moving Tips. The moving process can seem overwhelming at the beginning. You’re unsure where to start and everything seems confusing and new. Once you decide you want to use a full service moving company though, you have an ally in the moving process. The first step to take is to call the moving company. A representative will set up a time for a moving agent to visit your home. This meeting is called an Estimate Appointment. Read on to see what you should expect during this type of meeting. Just like any other meeting, there should be some element of preparation. According toShellie Law, Director of Sales at Crown Moving & Storage, the consumer should have a clear idea of what items they want to move and what items will be staying. It’s also helpful for the moving agent to have access to the attic and basement or have a detailed list of the items in those rooms. 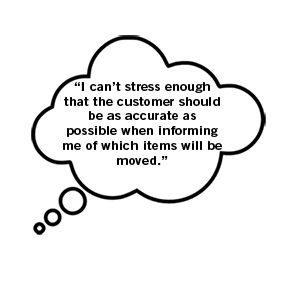 “I can’t stress enough that the consumer should be as accurate as possible when informing me of which items will be moved. The more accurate they are, the more accurate the price will be, and the happier everyone will be in the long run,” Shellie said. details of the move such as where you’re moving to, how big your new house is, what items you will be taking, and what you expect out of your move. After the conversation, you and your moving agent will walk through the house room-by-room and discuss the furniture and other items. The moving agent will take notes and use those notes to determine the expected cost of your move. The amount of time spent talking and walking through the house varies from person to person, but the appointment is usually no more than two hours long. until I know the estimated cost?”. In most cases the agent will get back to you within the same day however it might take up to 24 hours depending on the amount of appointments the agent has. Another helpful tip to know is that estimates are valid for only 60 days. If you receive the estimate more than 60 days prior to your move, there’s a chance it could change. These changes are due to the fuel surcharge and various other charges which are not controlled by the moving company. Once you decide which moving company to choose, you will begin coordinating and planning the actual move. Congratulations! You’ve successfully taken the first necessary step towards moving. If a move is in your imminent future, visit the Wheaton World Wide Moving Web site to request an in-home estimate. You can also contact us today at 1.800.248.7962 to speak to a Wheaton representative about your moving needs.